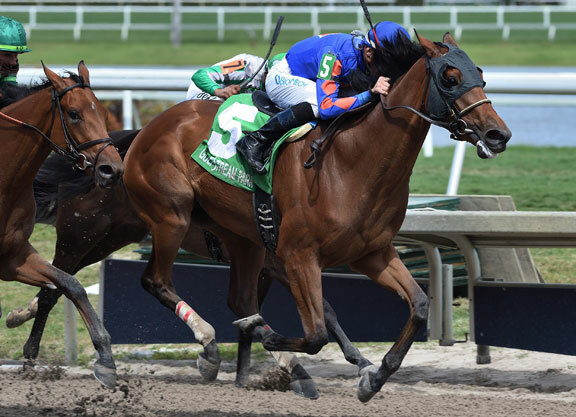 HALLANDALE BEACH, FL – Champagne Anyone (Street Sense) finally put it all together Saturday with a mild upset in the GII Gulfstream Park Oaks, earning a spot in the starting gate for the upcoming GI Kentucky Oaks. Dispatched at 7-1 while adding blinkers here, the bay stalked from second as Cookie Dough (Brethren) ticked off opening splits of :23.80 and :47.58. Drawing even with the pacesetter turning for home, Champagne Anyone took control in mid-stretch and held off a late rally down the outside from favored flashy debut winner Dunbar Road (Quality Road) to score. The gutsy Cookie Dough held third and previously undefeated second choice Point of Honor (Curlin) got up for fourth. A second-out graduate at Ellis in August, overcoming trouble, Champagne Anyone followed suit with an optional claimer score trying two turns for the first time at Keeneland in October, defeating subsequent GIII Tempted S. winner Oxy Lady (Oxbow) into third. Closing out her juvenile campaign with a fourth in a sloppy renewal of the GII Golden Rod S. at Churchill Nov. 24, she closed well to be third behind undefeated ‘TDN Rising Star’ Feedback (Violence) in the GIII Forward Gal S. here Feb. 2. The $70,000 KEESEP buy entered this off a third to 51-1 longshot Jeltrin (Tapizar) and Cookie Dough in the local GII Davona Dale S. Mar. 2. 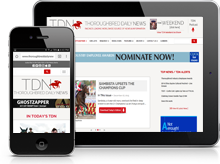 (Click here for a story by Brian DiDonato about the winning connections). Champagne Anyone is the 29th graded winner and 59th black-type scorer for her sire Street Sense. The winner’s dam Lucevan is a half-sister to Argentinian champion and U.S. Grade I winner Miss Loren (Arg) (Numerous) and MGSW Mr. Light (Arg) (Numerous), who at one point held the world-record time for a turf mile (1:31.41), set at Gulfstream in 2005. Her most recent produce is a yearling colt by Wilburn. The winner is bred similarly to Justify’s GSW half-brother The Lieutenant, GSW Cigar Street and SW & GISP Elnaawi. GULFSTREAM PARK OAKS-GII, $250,000, Gulfstream, 3-30, 3yo, f, 1 1/16m, 1:43.47, ft.
B-Stonestreet Thoroughbred Holdings LLC (KY); T-Ian R.
$267,950. Click for the eNicks report & 5-cross pedigree. 2–Dunbar Road, 122, f, 3, Quality Road–Gift List, by Bernardini. ($350,000 Ylg ’17 KEESEP). O-Peter M. Brant; B-Jeffery J.
Drown (KY); T-Chad C. Brown. $49,500. Fusaichi Pegasus. O/B-Arindel (FL); T-Stanley I. Gold. $24,750. Margins: HF, 3/4, 3/4. Odds: 7.60, 1.30, 2.90. Also Ran: Point of Honor, Safta, Bella Ciao. Scratched: Shacklette. Click for the Equibase.com chart, the TJCIS.com PPs or the free Equineline.com catalogue-style pedigree. VIDEO, sponsored by Fasig-Tipton.